$100 Gift Certificate Winner for June! This month’s winner is Taylor Donaldson, who is the lucky owner of this gorgeous live edge table. 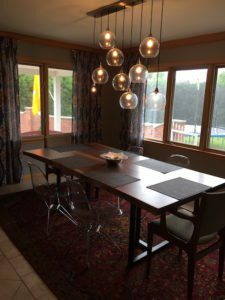 Taylor shared a picture of her table paired beautifully with mid-century modern chairs and light fixture. It’s a wonderful look for her casual dining space and tough enough to stand up to years of use and/or abuse from her three kids!